Rogue Wave Coffee co-owner David Walsh pours green beans into a coffee roaster, used to roast samples. Dave Walsh first started roasting coffee in Edmonton with his business partner more than a decade ago. They began with a roasting machine they built themselves, Mr. Walsh recalls, with the goal of making coffee for a living. "But life took its turns," he says. "We moved away. We moved back, but it was always in the back of our minds." Mr. Walsh and Dave Laville decided to revive that dream two years ago, launching Rogue Wave Coffee Co. not far from MacEwan University – at a time when Edmonton appears to be in the midst of a coffee consciousness-raising. Neither of the Daves is convinced their venture could have worked in an earlier time. 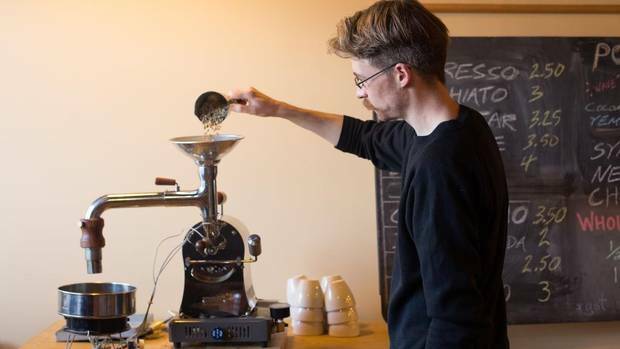 "Customers are more interested in craft coffee now," Mr. Walsh explains. "They take it more seriously." In fact, coffee culture has been steadily growing for years. The venerable Italian Centre Shop grocery store has quietly been pulling espresso since it opened in the early 1960s, initially for Italian immigrants who missed the joyous coffee culture of their homeland, but then in response to a broader audience quite amenable to the rousing powers of a silky cappuccino. The now-retired Java Jive was the first large-scale roaster in Edmonton, churning out its inaugural batches in 1976. Transcend Coffee started roasting single-origin coffees more than a decade ago – a bold move when the public was swept up in a twitterpated obsession with espresso-based but substantially doctored-up beverages. Transcend founder Poul Mark wryly dubs this the "Starbucks Effect." He notes that the public's gravitation toward the diverse flavour profiles offered by single-origin coffees recapitulates the "Third Wave" coffee philosophy that originated on the West Coast. A pour-over coffee at Rogue Wave Coffee. Edmonton was clearly receptive to Transcend's pared-down approach to coffee. The roastery's reach has expanded to include three cafés and another in the works. A strong half-dozen local roasters followed after Transcend broke trail. "Being the vanguard is tough," Rogue's Mr. Walsh says. "Transcend really opened up that path, and that made it easier for those who came after." Iconoclast Koffiehuis founder Ryan Arcand learned the art of coffee roasting by voraciously reading books on that subject while batch-roasting beans at home in a popcorn popper. "[Roasting coffee] reflects a grander rediscovery of our society's fundamentals," he says. "It marks a return to the mercantile era of shopkeeping." Mr. Arcand's coffeehouse opened in 2014, and welcomed patrons into a rectangular space characterized by trussed ceilings, a wood stove and a Turkish-made roasting machine that, visually, lies somewhere between a steampunk locomotive and a set of timpani. Mr. Arcand wholesales his Iconoclast coffee to a number of Edmonton businesses, but rejects ostentatious branding. "That wouldn't be in keeping with the spirit of the beverage. A coffeehouse is meant to be part of 'the commons,' and not an exclusive club of people who can afford a $6 cappuccino." Peter West, co-owner of downtown upstart Coffee Bureau with his wife, Cristiane, concurs. "The industry can be so trend-focused, but trends come and go. Quality doesn't go out of style." Dizzying arrays of West Coast coffees have penetrated the Alberta market, but the Wests gravitated to Edmonton-based Ace Coffee Roasters. For Mr. West, the decision was simple. "Ace produces a mid-roast Italian espresso and that flavour resonates with me. It's not rocket science." It oughtn't to be rocket science, but public perception of locally roasted coffee can be, at best, a picture of affected pedanticism or, at worst, fashionable fanaticism. Edmonton's compact cohort of roasters works hard to shift that archetype. "The moment that coffee leaves my hand, it's yours," says Mr. Arcand, "and I'm not going to tell you that you can't season it to your liking. You own it, not me." Coffee-making tools at Rogue Wave Coffee. Mr. Mark, the Transcend founder, hopes Edmonton's coffee scene continues to blossom, as consumers demand more coffee and new businesses emerge to feed the demand. "We need more options for our coffee culture to continue developing," says Mr. Mark, who bemoans Edmonton's tendency to dwell on comparisons to other, larger cities. "We aren't Vancouver or Seattle, and we shouldn't be too negative about ourselves," he says. "Edmonton still has a great coffee scene."